Has your car interior begun to look worn out, or smell bad and you cannot fight that smell with any car air freshener? Well, then maybe your car interior needs a deep professional cleaning. If you do not know how to safely and efficiently clean your car upholstery, do not hesitate to call our company right away and book our cleaners for help. 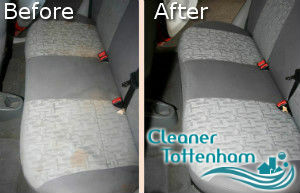 We are offering you our first-rate professional car upholstery cleaning service for a very attractive price, call us now, we are unmatched here in Tottenham. The cleaners working at our company have years of experience cleaning various cars and RVs, and we assure you you will love their work. And we have equipped them with all kinds of cleaning products that they need to adequately clean any type of car upholstery fabric. Our cleaners clean using steam cleaning machines of the latest fashion and you can rest assured that they will efficiently clean your car upholstery. They will carefully pre-treat any stain with the appropriate cleaning product and then they will steam clean all of the car seats thoroughly. We use steam cleaning method, because it is efficient and cleans and sanitises the car upholstery at the same time, plus it gets rid of any bad smell coming from it. 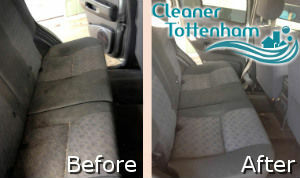 If you want a competent car upholstery cleaning service, call us now. Our cleaners are the best in N17 and they will give you outstanding results. We promise you your car will be clean and safe for your family. Take advantage of our affordable prices now.